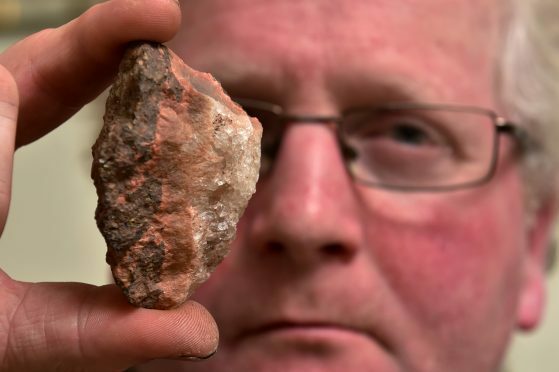 Did this man find a piece of the meteor which lit up Scotland’s skies on Hogmanay? A Montrose man is waiting to hear if he has found part of a meteor which lit up the night sky over Angus on Hogmanay. Glyn Lewis, 46, a keen amateur photographer, has sent off two images of a rock formation he found near his home in Ferryden to the British Meteorite Society. He was among hundreds of sky-gazers who witnessed the spectacle of a huge, green fireball which was spotted over Tayside at around 5.30pm on New Year’s Eve. Mr Lewis, a mechanics assistant with Altus Intervention in Portlethen, said: “I don’t know if it is the meteor or not. I was walking along the lighthouse road at Ferryden and on the skyline there was a flash. Mr Lewis investigated the area on New Year’s Day but his search proved fruitless. However, he revisited the stubble field at the back of Ferryden, just south of the town, at the weekend and found a solid mass of rock, about eight centimetres long and five centimetres wide, which he thinks may be part of the meteor. He added: “I have sent two photographs to the British Meteorite Society and am waiting to hear back from them. “My wife says it is just a bit of stone but it might be something. The meteor was sighted the length and breadth of the UK with locals left awestruck. The UK Meteor Observation Network (UKMON) said almost 600 people had recorded seeing the fireball. A statement from the group said: “Very large fireball meteor event was spotted over UK on 31 December 2017 at 5.33pm. “UKMON received over 570 public reports. Many observers reported green colour and fragmentation at the end.